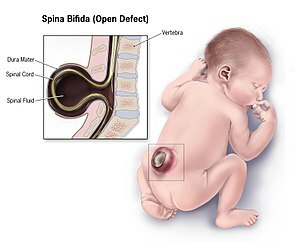 There is neither a single cause of spina bifida nor any known way to prevent it entirely. However, dietary supplementation with folic acid has been shown to be helpful in reducing the incidence of spina bifida. Sources of folic acid include whole grains, fortified breakfast cereals, dried beans, leaf vegetables and fruits. However it is very difficult for most women to get the equivalent of the recommended 400 micrograms of folic acid daily from unfortified foods alone. Globally, fortified wheat flour is credited with preventing 50,270 neural tube birth defects like spina bifida in one year, but 230,000 could be prevented every year through this strategy. Folate fortification of enriched grain products has been mandatory in the United States since 1998. This prevents an estimated 600 to 700 incidents of spina bifida a year in the U.S. and saves $400 - $600 million in healthcare expenses. The U.S. Food and Drug Administration, Public Health Agency of Canada and UK recommended amount of folic acid for women of childbearing age and women planning to become pregnant is at least 0.4 mg/day of folic acid from at least three months before conception, and continued for the first 12 weeks of pregnancy. 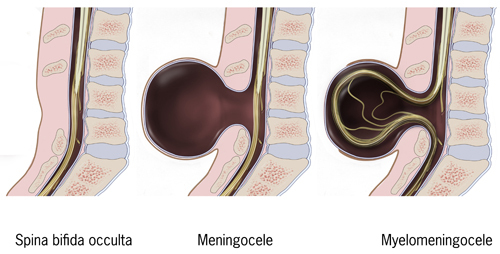 Women who have already had a baby with spina bifida or other type of neural tube defect, or are taking anticonvulsant medication, should take a higher dose of 4–5 mg/day. ^ Tinker, Sarah C; Hamner, Heather C.; Cogswell, Mary E.; Berry, Robert J. (2012). "Usual folic acid intakes: a modelling exercise assessing changes in the amount of folic acid in foods and supplements, National Health and Nutrition Examination Survey, 2003–2008". Public Health Nutrition. 15 (7): 1216–1227. doi:10.1017/S1368980012000638. ISSN 1475-2727. ^ Waitzman, Norman J.; Kucik, James E.; Tilford, J. Mick; Berry, Robert J.; Grosse, Scott D. (2016-05-01). "Retrospective Assessment of Cost Savings From Prevention: Folic Acid Fortification and Spina Bifida in the U.S." American Journal of Preventive Medicine. 50 (5): S74–S80. doi:10.1016/j.amepre.2015.10.012. ISSN 0749-3797. PMID 26790341.